With FERTAN rust is converted into an ideal paint base. FERTAN eliminates sanding, deep brushing, sandblasting. Safe and easy to use, no isocyanates or flammable components. Fertan is a patented product that pulverises rust and leaves an inert layer of metal ready for painting. Once Fertan is applied clever chemistry ensures that there are enough active ingredients to destroy the rust but no more. As these get used up more are produced. Fertan doesn't attack good metal, just the rust. During conversion loose rust is detached, Fertan uncovers clean metal and creates a bonded film, protecting the metal from possible future attack. This film or coating is a bonded layer of non-rusting ferro-tannic insoluble compounds . This surface is neutral and, once rinsed to remove rust dust, is ready for painting. 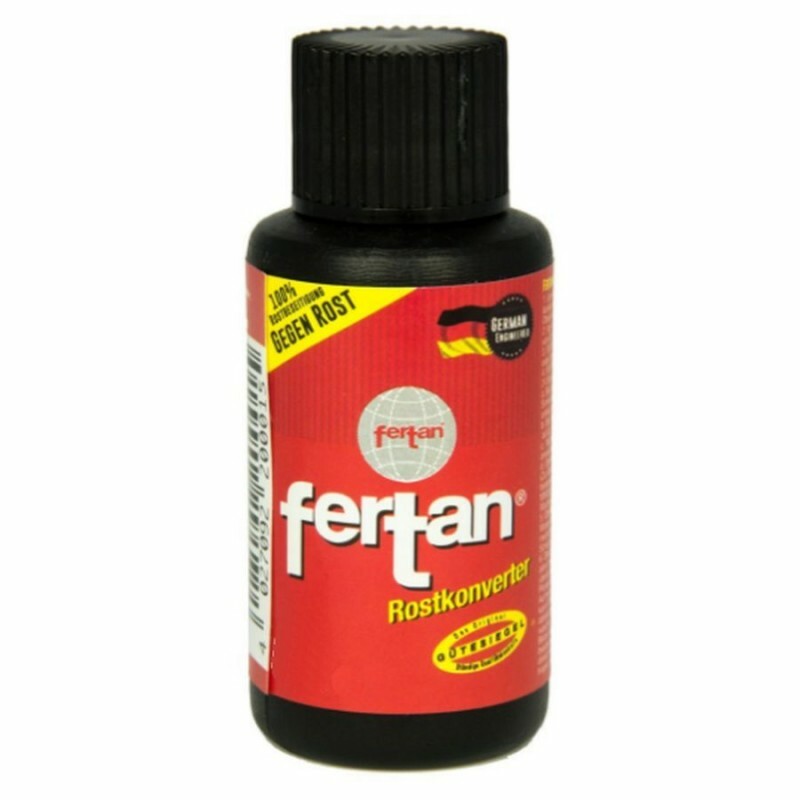 Fertan may be applied to slightly rusty metal, hard rust, or bare metal to protect it from future rust. Fertan's aqueous solution penetrates everywhere, even through paint cracks or panel joints. It can be applied on damp or wet surfaces indoors or outdoors in any weather conditions. Outside, avoid frost. It is harmless to plastic, rubber, chrome and already painted surfaces. FERTAN is only active in contact with steel, iron or rust. It can be washed off from any other surfaces with water. Non-flammable, non-volatile, harmless to health either by physical contact or fume inhalation. FERTAN provides long-term protection to iron and steel but the surface should be painted within 6 months.